The north transept contains a chapel dedicated to the Sacred Heart of Jesus, featuring a modern statue of Christ in stone. It is a noble image of the Saviour showing his love for humanity. The warm red marble (the colour associated with the Sacred Heart) for the Corinthian columns and pilasters was shipped from Italy during the construction of the church. The statue is surmounted by an elegant segmental broken pediment. The platform in front of the altar is decorated with an intricate pattern of inlaid marble. Devotion to the Sacred Heart of Christ, a living symbol of Divine Mercy, grew in popularity in the seventeenth century, after a series of revelations to St. Margaret Mary Alacoque, a French nun. 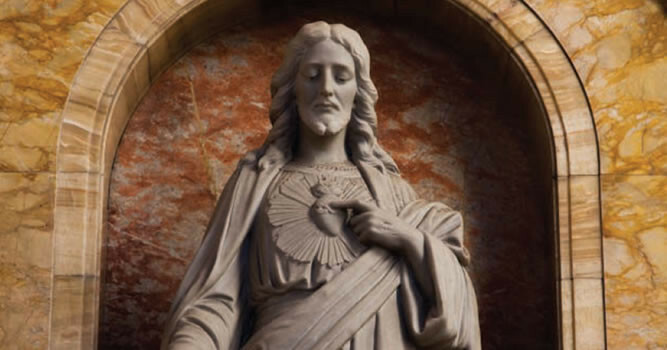 Devotion to the Sacred Heart was a remedy to Jansenism, a heresy that ravaged seventeenth-century France and taught an excessively pessimistic view of fallen human nature and Divine predestination. St. Claude de la Colombière, a young Jesuit priest who spent time in England (c. 1676) as court preacher to Mary of Modena, wife of the future James II, did much to promote this devotion.